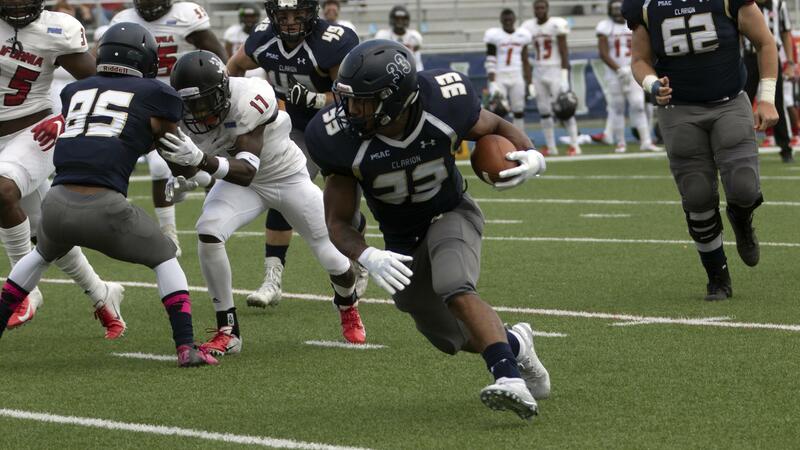 INDIANA, Pa. (EYT) – After having its four-game win streak snapped last week, Clarion continues an uphill climb this week when it travels to IUP for a Noon kickoff against the suddenly reeling Crimson Hawks. Two weeks ago, IUP was riding high with dreams of a national title. The Crimson Hawks were 4-0 and ranked No. 2 in the country in NCAA Division II. But losses to California (Pa.) (36-24) and Slippery Rock (30-27) has left IUP (4-2 overall, 1-2 PSAC West) examining what has happened to a once-promising season and needing to probably win out if it wants any chance at all of making the D2 playoffs. Clarion (4-2. 2-1) hasn’t beaten IUP in eight years since winning two in a row in the series in 2009 and 2010 with the 21-14 victory in 2010 being the Golden Eagles last win in Indiana. Clarion’s four-game win streak may have been a bit of mirage considering the Golden Eagles victories came against teams that went into last week with a 1-19 record but give Clarion credit for winning the winnable games. But after allowing just 32 points in the last three games of that streak, Clarion gave up 41 in the 41-27 loss to Cal. The good news would be that the 27 points were the most the Golden Eagles had scored since a 44-7 win Sept. 15 against Lincoln. The offense got a boost from the return of running back Mylique McGriff. McGriff ran for 137 yards and two touchdowns against Cal and has 304 yards and four touchdowns on the season while averaging 4.5 yards per carry. Jeff Clemens has reclaimed the starting quarterback spot after losing it then sharing it earlier in the season. Clemens is 67 of 127 passing for 926 yards, five touchdowns and eight interceptions on the year. In his last two games, he has passed for 550 yards and three touchdowns while also throwing three picks. Marcus McCoy (16 catches, 270 yards, 3 TDs) and Dana Jackson (13 catches, 265 yards, 3 TDs) have emerged as the leaders of the receiving corps. Layne Skundrich (49 tackles), Alec Heldreth (38 tackles, 4 ½ sacks) and Sam Fareri (30 tackles, 3 interceptions) lead a defense that allows 21.5 points per game. IUP averages 34.3 points per game and 396.7 yards per contest. Quarterback Lenny Williams is a dual-threat with 1,250 yards passing (79 of 131) with 13 touchdowns and six interceptions and 286 yards rushing and three touchdowns. In the loss to Slippery Rock, though, he was held to negative three yards rushing on seven carries after not being held to fewer than 29 yards on the ground in any game this year and rushing for at least 59 yards in four contests. He did throw for 350 and three scores in the loss. Dom McNeil (23 catches, 486 yards, 4 TDs), Ricky Rodgers (14 catches, 238 yards, 4 TDs), Dwines Walls (14 catches, 168 yards) and Justice Evans (8 catches, 168 yards, 2 TDs) give IUP plenty of pass-catching threats. Samir Bullock is the leading rusher for the Crimson Hawks with 308 yards and two touchdowns but missed the game against Slippery Rock and will miss this week’s game with a torn MCL. Without Bullock and with Williams being bottled up, IUP ran for just 69 yards vs. Slippery Rock led by Evans’ 39 yards with Chris Temple adding 33 yards. IUP’s defense allows 19.0 points per game and is led by Damon Lloyd (52 tackles, 2 sacks). NOTES – A Clarion win Saturday would hand IUP its first three-game losing streak in the same season since losing four in a row in 201 with the loss to Clarion that year being the second in that span. The Crimson Hawks have lost two in a row for the first time since 2014 when it happened twice (IUP lost three in a row between the last two games of 2014 and the first game of 2015).